Save SAR 60 (20.07%) – Earn 23 Shukrans What is Shukran? Shukran is the Landmark Group’s award-winning loyalty programme in the Middle East, which allows you to earn Shukrans when you shop any of our brands. 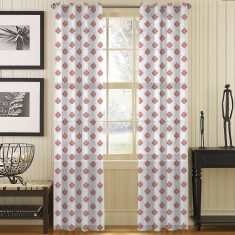 Pick this printed and sheer curtain to deck up your lovely house. This curtain can be put up in any kind of decor and will add a contemporary touch to it.